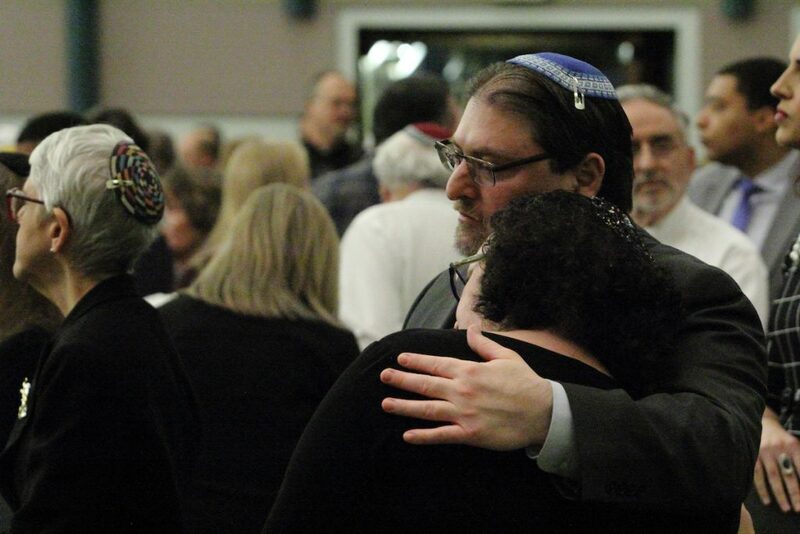 Photos taken by Peter Wine & provided by the Jewish Federation of Greater Dayton. 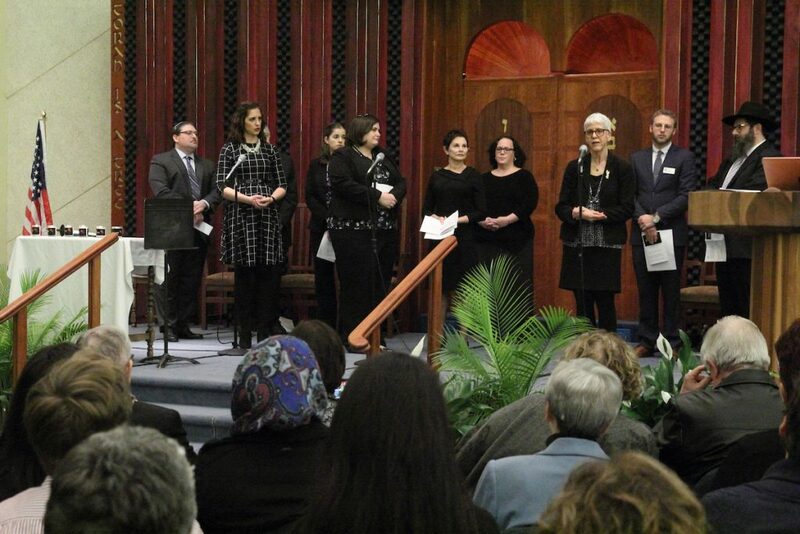 Last Tuesday, the Jewish community of Dayton gathered to show support for those who lost their lives in a recent shooting at a Pittsburgh synagogue. The event was coordinated by The Jewish Federation of Greater Dayton, a nonprofit based in Centerville, and the rabbis of Temple Israel, a synagogue located in downtown Dayton. “The purpose was to give people the space to grieve, to be together, to show solidarity and to discuss hope for the future,” said Cathy Gardner, CEO of the Jewish Federation of Greater Dayton. Community partners including law enforcement, county administration and Young Women’s Christian Association (YWCA) of Dayton lit candles to celebrate the memory of each shooting victim, according to Gardner. Rabbis and other spiritual leaders spoke with community members about the importance of holding onto hope. “It was beautiful. One of the rabbis said, ‘I have hope because from the tiniest light, you can dispel darkness,’” Gardner said. Churchgoers also sang Hatikvah, the Israeli national anthem, which is translated to “the hope” in English. About 1,100 people attended last week’s community gathering. Attendees included members of an LGBTQ church, the Young Women’s Christian Association of Dayton and people from the Muslim community. On Oct. 27, a gunman opened fire at the Tree of Life Congregation Synagogue in Pittsburgh, Pennsylvania. The attack lasted for 20 minutes before the gunman was apprehended by law enforcement. In that time, eleven people were killed and six others were injured. The shooting marks the deadliest attack committed against Jews in the history of the United States. Those who lost their lives were brothers David Rosenthal, 59, and Cecil Rosenthal, 59; Richard Gottfried, 65; Jerry Rabinowitz, 66; Irving Younger, 69; Daniel Stein, 71; Joyce Feinberg, 75; husband and wife Bernie Simon, 84 and Sylvan Simon, 86; Melvin Wax, 88; and Rose Mallinger, 97. The suspect has been identified as Robert Bowers, 46. He has been charged with 44 counts, including hate crimes, murder and obstructing religious practices, to which Bowers pleaded not guilty. Prosecutors are seeking the death penalty against Bowers. Information from the event organizers with the Jewish Federation of Greater Dayton was forwarded to the campus community by Gary Dickstein, interim vice president for Student Affairs at Wright State. “At this emotionally devastating time, the Jewish Federation of Greater Dayton stands resolutely with the Jewish community of Pittsburgh. We reaffirm our duty, as fellow Jews, to support our brothers and sisters in this harrowing time,” the email reads. President Cheryl Schrader also addressed the attack in an email to campus. “It is with a heavy heart that I write to you about the senseless acts of violence at Pittsburgh’s Tree of Life Synagogue this weekend, as well as in Kentucky, where two African Americans were slain at a grocery store,” Schrader wrote.